Use your scissors to cut the black paper so it will fit in the bottom of your pie pan. Tips for Home Scientists: This activity works best on a sunny day. Add 1 tablespoon of Epsom salt to 1/4 cup of warm water. Stir until the salt is dissolved. Pour the salty water onto the black paper in the pie pan. Put the pie pan out into the sun. When the water evaporates, you'll see lots of crystal spikes on the black paper! The Mudd family discovered that these crystals look great under a microscope. Why does Epsom salt make crystal spikes? When you add Epsom salt to water, the salt dissolves. When you leave the pan in the sun, the water evaporates and the salt forms crystals shaped like long needles. If you tried this experiment with table salt instead of Epsom salt, you wouldn't get crystal spikes. That's because table salt and Epsom salt are chemically different, so the crystals that they form are very different. The picture on the right shows part of an artwork created for the Exploratorium by Swiss artist Jörg Lenzlinger. He mixed different kinds of salts with water. 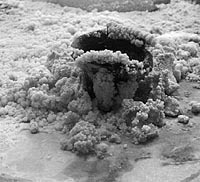 As the water evaporated, the salts crystallized, making beautiful shapes that kept growing and changing. To learn more about this salt crystal artwork, visit our Complexity website. 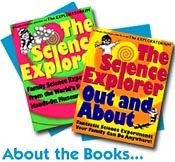 This and dozens of other cool activities are included in the Exploratorium's Science Explorer books, available for purchase from our online store.